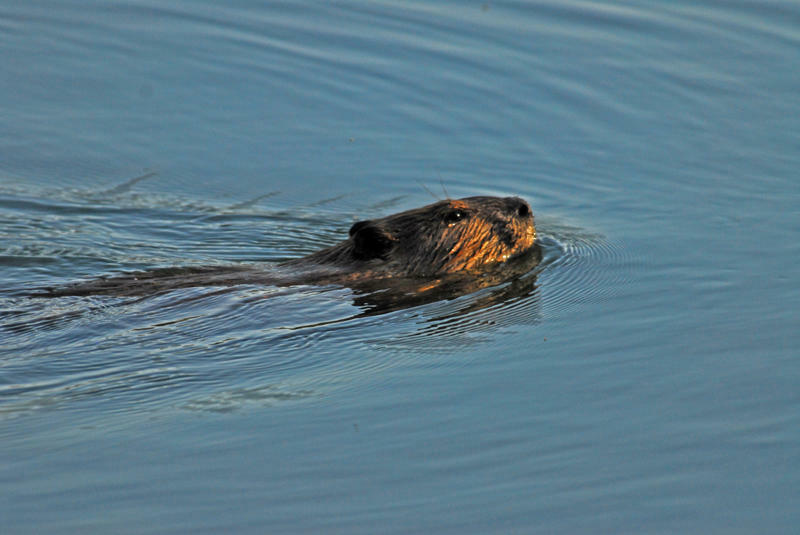 Beaver photo by Bruce Johnson. south of SR 32 and supports a dense riparian overstory and lush understory. Much of the site’s flora is invasive exotic species, although native plants, including cottonwoods, willow, and valley oaks, are also present. The site provides habitat for a variety of wildlife, including two special status species, the western pond turtle and valley elderberry longhorn beetle (habitat). The ponds host resident Canada geese and wood ducks, migratory waterfowl, songbirds, raptors, beavers, and even the occasional otter. Like much of our National Wildlife Refuge system, this is a wetland created by people, replacing wetlands that can no longer form due to the dams and diverted waterflows in California and elsewhere. Although the ponds may have been created by accident, they provide a valuable habitat for all kinds of wetland inhabitants who depend on them. With 90% of the original wetland habitat of California gone, the ponds are something to treasure. See the drop down menu above for the nature photo gallery. Also see “links” for articles on the nature of Teichert Ponds.